Jean-Paul Sartre once said 'I hate victims who respect their executioners'. Admirable though that is, perhaps he'd not last long in F1. Therein, realpolitik is often what prevails. Despite occasional immediate appearances suggesting otherwise, grudges often come a distant second. As an example, I recall some years ago in what must have been the late 1990s watching a Grand Prix wherein the TV feed cut to Alain Prost - then boss of the team that took his name - sat on the pit wall. But who was it sat alongside him? None other than Cesare Fiorio. The same Cesare Fiorio that was Prost's boss at Ferrari; that infamously Prost didn't see eye-to-eye with; that Prost was instrumental (apparently) in forcing out. 'How could Fiorio bring himself to work with him again?' I thought in my naivety. Little did I know. But of course it's not an isolated case. Far from it. This year we witnessed the long-assumed unthinkable rapprochement of Kimi Raikkonen and Luca Montezemolo. Heck, even the rumour of the incendiary Fernando Alonso and Ron Dennis pairing happening again while considered unlikely hasn't been laughed all the way out of court. Perhaps it's just the sport's way - all's fair in love and F1 after all. Maybe they learn not to take things personally, even when knives are plunged into their back. Perhaps it's more simple than that and reflects F1's rather exclusive status, with a (very) finite number of places in it, the places really sought after even more so, meaning most are able to park such things in a mental recess if it entails not being the one without a seat when the music stops. "Jenson button usgp 2004 onstage". It could all be just as well in particular for Jenson Button, on the subject of seats and making sure you have one. It's a hardly-concealed fact that his at McLaren for next year and beyond ain't certain as things stand; that McLaren's been scanning for alternatives. One such alternative mooted is the prodigious Valtteri Bottas (though quite what the Finn would get out of this is less clear to me). There has been some speculation that if that does indeed happen then Button could make the opposite journey, back to Williams. I didn't think it at all coincidence that he said some very nice things about the Grove team recently. He has previous with the team too. We all know that Jenson made his F1 debut for Williams in 2000, but the previous is a little more knotted than that. Jenson in his freshman year at Grove 14 years ago was to a large extent on a hiding to nothing, as he was there as a stopgap until Juan Pablo Montoya's CART contract wound down, meaning despite impressing his fate of being dumped at the season's end was mostly inevitable. The next year he drove for Benetton instead. There he experienced second-season syndrome in 2001, but managed to recover (the team now with the Renault moniker) in 2002, though not enough to avoid being ditched again, this time in preference for the incumbent test driver going by the name of Fernando Alonso. But Button surfaced again, this time at BAR, which for most of its existence had been quite the vainglorious joke. But by now under David Richards' stewardship it was beginning to show signs of making good on the latent potential, and Button was determined to play full part. In 2003 he put the squad's (expensive) perennial Jacques Villeneuve away, then in 2004 it appeared that things were coming good for him at last with firm best-of-the-rest casting behind the dominant Ferraris and a series of podium finishes, culminating in an excellent one in Germany, coming through the field from a P13 start to finish second. But the tune of the nice guy finally finishing far away from last almost immediately experienced a major bum note. Days after that race Button's manager faxed the BAR team announcing that his charge had signed for Williams for the following season. Which was news of the particularly acute variety to BAR as it reckoned it had Button under contractual lock and key for then thanks very much. Given this was nice guy Jenson, then as now all affability and easy charm, it all had a strange otherworldliness; a little like discovering after all of this time that Paddington Bear had in fact filled his sandwiches with stolen marmalade. In this ilk, I recall a tense interview for Button with ITV as part of its coverage of the next round at the Hungaroring, which had until then given Jenson routinely the soft soap. Button's eyes screamed all of the desperation and confusion of one being held captive against his will. Time was that F1 was something like the wild west when it came to contracts. Namely that there wasn't a lot anyone could do to stop a driver driving for a team they wanted to, regardless of what any inconvenient ink might state. Ayrton Senna for one had apparently demonstrated as much by leaving Toleman for Lotus at the end of 1984 despite being in the middle of a contract at the former; similar happened when Alain Prost left McLaren for Renault at the conclusion of the 1980 season. Button was possibly counting on similar - though he sought to justify the move by citing a clause in his BAR contract that allowed him to move if the team's Honda engine deal was in doubt. Though quite what the doubt amounted to - as the Japanese concern had not long before reaffirmed its commitment to the team - was lost on most. A few cynics reckoned instead - and perhaps typically - it was in fact all about money. More specifically about a disagreement on a points-related bonus payment scheme. But the world had changed since Senna and Prost performed their respective stunts. Or rather F1 had changed as a Contracts Recognition Board - there to resolve such disputes without the need for lengthy recourse to the courts proper - had since been set up by the FIA. And come October it ruled in BAR's favour, leaving Jenson no choice but to return sheepishly to the enclave that he had previously and publicly rejected. But few fully appreciated the significance - or rather than immediacy of the significance - of Button's words in reaction to the CRB decision: 'I look forward to joining the Williams team in the future' he said. As almost exactly 12 months on - again while all were gathered at the Hungaroring - we experienced something close to a mirror image. Button had only gone and signed for Williams for 2006 - and had a right to this time - not long after the above had played out. But sadly in the months since he decided he'd rather stay at BAR after all. Williams had lost its BMW works engine deal while Honda had increased its own involvement in BAR, indeed would take the team's name for the following year. In an astonishing boot on the other foot situation Jenson claimed now his signed Williams contract wasn't binding and he'd in fact rather drive for BAR. 'I suppose it is ironic' noted Button from behind a nervous grin. But he went on: 'I don't think any team would want a driver that would like to be racing for someone else', demonstrating that not everything had changed. But Frank Williams wasn't for budging. And his team outlined as much firmly - mainly in words of one syllable - as well as fired the odd hostile shot in Jenson's direction about the importance of sticking to one's word. And another thing that hadn't changed was again the original contract, this time the Williams one, was the one that stuck. 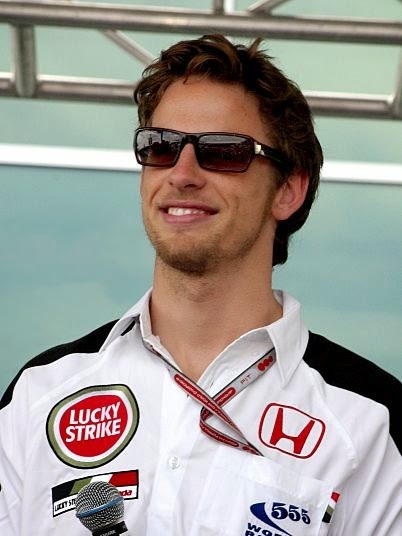 Button did though manage to free himself, in exchange reportedly for 35 million US dollar bills (incidentally it was a certain Nico Rosberg who got the Williams drive instead - getting his F1 break). You'd imagine that Sir Frank - like many in this game - is not one for bearing grudges. A fact that may yet elicit a sigh of relief from Button.